One camera is better than none when trying to preserve memories or information from an event. Some events lend themselves nicely to the one-camera shoot where zooming in and out occasionally gives you everything you need for visual variety. There are other events where having at least a second camera, is beneficial if not critical to the mission. It’s all about choices. In scripted videography you have the benefit of being able to shoot the same shot at multiple angles and as both a close-up and wide-shot. Event videography does not afford you the same opportunity. There are no do-overs. The multi-camera setup allows you to have at least one camera set on a wide-shot all the time and another camera roving on close-up shots. Editing is where you marry the two together in what will hopefully be a visually more appealing video than if it were a one camera shoot. The wide shot is your base shot or safety shot where you know you will not miss any action. Your additional cameras are your b-roll capturing the same activity close-up and at different angles. I am writing this for producers who intend to edit their footage later rather than mix on the fly during the event. The plan still has applicability either way, but it is written with editing in mind. You’ll need to know how many cameras you are running ahead of time. Determine your position for each of the cameras relative to the action and decide which camera / operator will do the wide shot and which will do the roving close-up shots. Yes, you really should have a camera operator for the wide shot. If for no other reason than to make sure the camera does not get knocked into in a crowd and ruin the shot. The other reason being that you will hang your main audio off the wide shot and will need a knowledgeable crew member to monitor audio during the show. If you are just running two cameras you can have them run side by side. If you were to add a third camera you would want your wide shot in the middle and a camera angled on either side for roving close-ups and pan shots. Make sure each camera/operator is assigned a role and sticks to it. The last thing you want to find out in editing is that both of your cameras took the exact same shot. As mentioned above, your wide shot camera will capture the main audio. You will want to make sure the person running that camera is also comfortable in monitoring and adjusting audio levels. You will want to make sure that the other cameras in your setup can capture some level of audio. This audio is important for syncing all the footage from the various cameras in editing, but will be discarded from the final product. The final piece to this setup is syncing all the cameras. This is extremely important. All the cameras must start and stop at the same time and at the same intervals so they have the same time code in editing. For example; if you know your event is to begin at 7:00pm, make sure all your cameras start recording at 6:55pm. The cameras should not stop recording until two minutes after the event has ended. This buffer of time at the beginning and end of footage from each camera will allow the editor to sync all the footage once and proceed with editing. 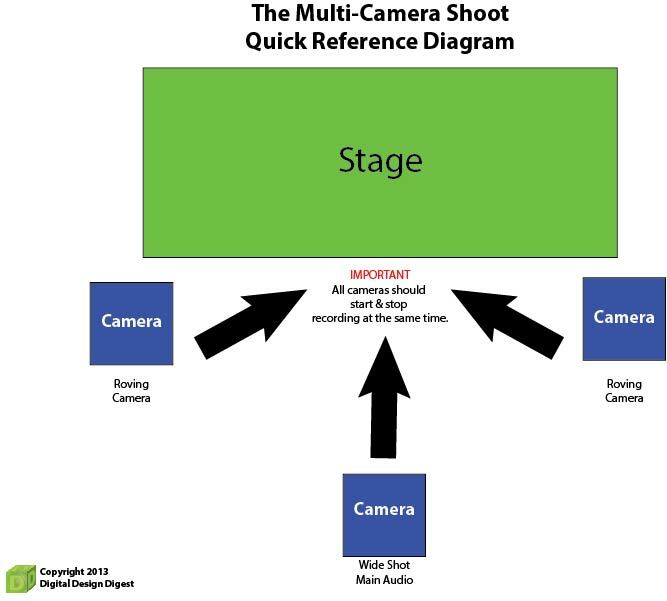 If one of the cameras stops for 5 minutes in the middle of the show and the others keep recording then there will be a sync issue somewhere in the middle of the footage. That will result in extra time for the editor to find the issue and re-sync additional points in the footage. Can you describe or provide a diagram of the layout of the room? Are there power outlets available? How much flexibility do I have for camera placement? Depending on camera placement, how much traffic will be moving round the cameras? The more information you can get up front the easier it will be to plan for gear needed and prepare your crew for the event. Setup will go smoother if you can walk in with a game plan. Technical Tales of Woe – Standards? What Standards? About two years ago I needed to retire my old G5 Mac and after months of research and consideration I finally bought a new 27” iMac computer. 1 It has tons of memory, a big beautiful screen for editing video and overall faster performance than my former G5. At that time I was still using my MiniDV, tape based camera for shooting. My research included assuring that this older camera would connect with this new computer and software. It did, eventually, but not without an absurd amount of effort on my part to troubleshoot an issue that all boiled down to what brand wire I used to make the connection. Apparently not all FireWire cables are created equal. I knew something was wrong when I plugged in the FireWire 800 cable to the camera and saw the “DV-In” notice blinking furiously on the screen. I only had the computer for less than a week and was already wondering if I got a lemon. I checked all my connections to make sure they were fully engaged. I researched the issue online, made sure all my drivers were up to date and even tried engaging the camera through different editing software programs.2 The results were the same. The computer and camera were not making a steady connection. I sent the computer in to the shop for assessment and it came back with a clean report. I called Sony, the manufacturer of my camera, to see if they had any advice. No luck there. This went on for two weeks because I assumed the issue was with two of my main components to the technological equation. After concluding the issue did not rest with the computer and that nothing could be adjusted on the camera I began to resign myself to the fact that I would need to upgrade to a newer camera. It was an investment I knew was coming, but had hoped to put off for awhile. But before I made that leap I decided I would buy another FireWire cable, just in case it turned out this issue was with a bad cable. The original cable was a generic brand FireWire cable. I really didn’t think anything of it when I bought it. Firewire is FireWire. A standard data transfer cable. I spent months researching computers, software, hard drives and even cameras. Of all the pieces to the technology puzzle I figured the FireWire cable was a no-brainer. Before buying the second cable I decided to read some of the user reviews. I could only laugh and shake my head at what I learned. The brand cable purchased did not play nicely with Apple computers! Had I bought a second cable I would have had the same problem. I began looking at other brand cables and reading the user reviews closely. I found one that had positive reviews from Apple owners. The camera worked great with the new cable…for a few months. I ended up needing to replace my 5 year old camera anyway do to aging mechanics. Regardless, I learned something about standards….it varies from brand to brand and now I research even the smallest, least expensive components before buying. It may shock some of you that I am not a devout Apple owner. I did have to think about getting another one. Two years later there are no regrets in doing so. My computing needs, however, have changed since then and so has Apple. To keep my options open my laptop ended up being a Toshiba. Another Technical Tale of Woe in standards – Final Cut will not import AVCHD directly. iMovie is needed to recognize the camera and capture the footage. Final Cut, circa Pro X, was the semi-pro and pro option for editing the footage once it was captured. Adobe CS4 would import AVCHD but crashed on a regular basis during editing. Adobe CS6 is an improvement.